Andhra Pradesh Integrated Common Entrance Test is conducted on a yearly basis by the Sri Venkateswara University, Tirupati on behalf of Andhra Pradesh State Council of Higher Education (APSCHE). Through this examination, aspirants can get into different Masters in Business Administration (MBA) and Masters in Computer Applications MCA courses in various colleges. Mode of Examination The examination is only an offline (paper-based) exam and is not available in the online format. Marking Scheme Each correct answer is awarded one mark. Incorrect answers are not penalized. No marks are awarded or deducted in case of not attempting the question. -Business and Computer Terminology: It has 10 questions and hence a weightage of 10 marks. No specific time allotment exists for each section. The candidate must be an Indian National and must satisfy local/non-local status requirements that have been given by the Andhra Pradesh Educational Institutions. A candidate should satisfy the rules of the respective universities of where they take or would like to take admission. The candidate must have studied and passed 3 year Degree course in any faculty conducted by the Universities or its equivalent Degree Examination in 10 + 2 + 3 patterns as recognized by U.G.C (University Grants Commission). In order to pursue an MBA, a candidate must have a degree of 3 years duration from any recognized University or its equivalent with Mathematics as one of the subjects at 10th class level. In order to pursue an MCA, a candidate must have a degree of 3 years duration with “Mathematics” as one of the subject at Intermediate or Degree level. A candidate with an aggregate mark of 50% and 45% in the case of reserved categories will be eligible to get admission through ICET according to the AICTE Approval Process Handbook 2017-18. A candidate will need to meet all the eligibility criteria laid down in relevant Government Orders in vogue at the time of admission. In case a candidate has pursued a Distance Education Degree it must be recognized by Joint Committee of UGC, AICTE and DEC/DEB. A candidate who is appearing for their final year degree examination will also be eligible to appear for APICET-2017. The fee for ICET examination is INR 450. The application process for the AP ICET will open around 1st week of March 2018. The process will end around 1st week of April 2018. The application process is only an online process whereas the payment can be done both online and offline. A candidate will need to begin by visiting the official site. Here, they will find a link to “Apply online”. The candidate is first led to the payment page. The fee is 450 INR for the registration. In this page, a candidate will first need to fill out details like Qualifying Examination Hall Ticket No., Candidate’s Name, Date of Birth, Mobile Number, Mobile No. Mentioned above belongs to Self or Father or Mother or Relative, Alternate Mobile Number and E-Mail ID. After filling the details, a payment page will open where online and offline payments can be chosen. In case of online payments, one can choose between net-banking, credit card, and debit card to make the payment. In case of an offline payment, any APOnline centers can be visited and a cash payment can be made. After this, a receipt will be given. On filling in relevant details a candidate can proceed further. On successfully completing payment by either means, the candidate can check the status of payment. They can also will the rest of the application. Certificates such as board certificates as well as Aadhar cards will need to be kept nearby to fill out needed details. A photo and signature will also need to be uploaded to the website. After filling up the form, one can submit the form and print out the filled form for future reference. A registration number will be obtained and this will be needed for further reference. In 2017, the admit cards were open to download from the 28th of April. The hall ticket can be downloaded from the official AP ICET website. Here the registration number and the date of birth will need to be entered in order to access the admit card. 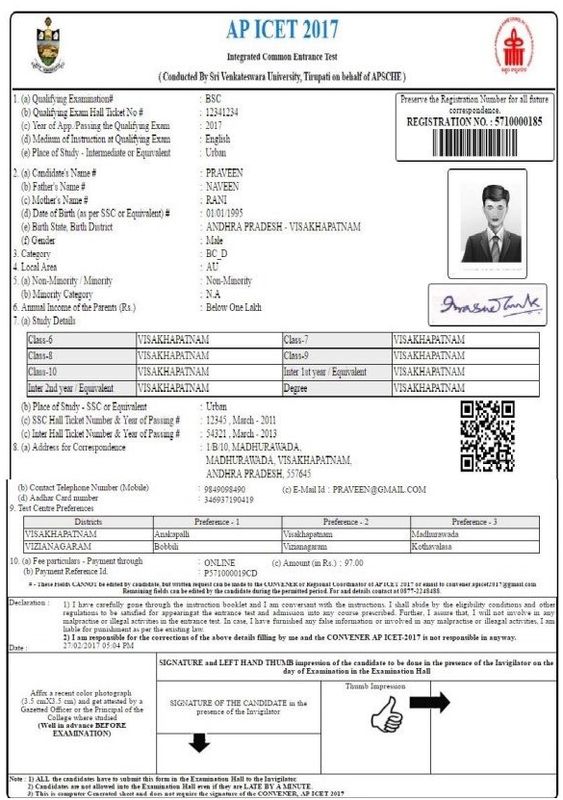 The admit cards consists of details such as Candidate’s Name, father’s Name, local status region, family income, the category of candidate, exam Center, date and time of the examination, study Details and more. The rank card can be downloaded using hall ticket number, registration number, and date of birth. Rank card is usually available in early June. In order to obtain any kind of admission, a candidate will first need to qualify for the examination. The ranks are then considered to give them admission according to their choice. A candidate will have to score a minimum of 25 percent i.e 50 marks out of 200 in order to qualify the examination. This condition does not need to be met in case the student belongs to the SC/ST category. Then, all students are given ranks in the common merit list based on their marks. By considering the marks scored in Section-A. If the tie still persists, then the marks scored in Section B will be taken into considerations. If the tie still persists, the tie will be resolved by taking into account age of the candidate. The older candidate will get first priority. The counselling procedure happens in the month of July. Candidates who are interested will need to get their documents verified. Post verification, web counselling begins where the candidates can prioritize the college of their preference and course. Based on the rank obtained, candidates will be allotted seat over a course of various rounds. All the above mention dates will be announced by the AP ICET committee post the announcement of results. The notifications for the exam will start by late December 2017 and the registration for the exam will open up by February 2018. Local newspapers will also carry notifications about the exam. It is advised that the candidates have a look at the eligibility criteria before applying for the exam. The eligibility criteria differ from course to course. Procuring knowledge about the timeline of the exam gives applicants an opportunity to complete all the formalities within the stipulated time. All the details about the different events are explained clearly on the official website. The conducting authority also gives students an opportunity to challenge answers given in the answer key. It the applicants feel that an answer to the question is wrong, they can challenge the question. The conducting board will then inspect the question and come up with the correct answer. The following lists all the places where the exam will be conducted in the state of Andhra Pradesh. It should be noted that although candidates are asked to choose their preferred exam center, the conducting authority can change the exam center based on the availability. The final exam center allotment will be specified in the admit card. If candidates need any kind of clarification or are in doubt, they can contact the authorities using any one of the below-mentioned methods. The candidates are requested to go through the frequently asked questions section if in need of help or have a doubt. If they do not find anything useful in the FAQ section, they can contact the authorities. The conducting authority will reply back as soon as possible. To get a complete list of the participating colleges, please visit the official website. For candidates belonging to the general category, the minimum cut off marks are 25% of the total marks i.e. 50 out of 200 should be scored. There are no specifications for candidates belonging to other categories. The score is only valid for one year. A candidate cannot apply for universities based on the AP ICET score secured in the previous years. Candidates belonging to different communities have a percentage of seats reserved for them. The following table gives these percentages. It should be noted that candidates who want to avail seats based on the above-mentioned reservations, should produce the proof stating that they belong to that particular community. If they do not provide any proof, then they will be considered as candidates belonging to the general category. Candidates belonging to the minority community will need to bring a minority certificate as a proof. Additionally, candidates belonging to the Anglo Indian community, CAP or the sports quota have to give the respective certificate of proof. Candidates are also requested to take photocopies of the above-mentioned documents. Followed by the verification process is the seat selection process where candidates can choose their college and their stream based on their marks, cut off marks of the university and the availability of seats. Once the selection of seats is done, the seat allotment will be done. If the candidate is happy with their allotment they can proceed forward and pay the fees. The fee structure of each university will be given to the eligible candidates. The classes usually start from late June or early July. It is always beneficial to practice previous year’s question papers and sample papers. This gives applicants an idea on the level of questions that will be asked in the exam. This also serves as a self-assessment mechanism as it gives applicants an opportunity to analyze their performance and prepare accordingly.